Nearly the entire vegetation landscape of British Columbia is shaped by wildfire. The wildfire regime of a place is determined by the frequency, intensity, extent, and seasonality of wildfire, and especially the variability in those components. The fire regime affects biodiversity through two main processes. First, the specific fire history of an individual site influences the species that are able to persist at that site, the availability of light and nutrients, the quality of the substrate, and the distance to propagules. Second, variability in the fire regime across the landscape gives rise to environmental heterogeneity across the landscape – favouring different assemblages of species. For example, frequent low-severity fire favours the establishment of species like ponderosa pine (Pinus ponderosa), that have fire-resistant bark. Infrequent stand-replacing fire favours species that are shade intolerant, such as Douglas-fir (Pseudotsuga menziesii) (in coastal BC) or lodgepole pine (Pinus contorta) (in the interior). The fire regime itself is a product of several interacting factors – generally categorized as top-down controls, and bottom-up controls. Top-down controls include those external to the ecosystem – including mean climatic conditions, variability in weather conditions, and the frequency of ignitions (either anthropogenic or natural in origin). Top-down controls influence the fire regime through direct and indirect mechanisms. Mean climatic conditions determine the pool of species that are capable of becoming established or persisting at a given location. The vegetation composition in turn controls the abundance, continuity and structure of fuels. Variability in climate at scales of seasons to years contributes to variability in the relative abundance of fuels and the flammability of the site. At sub-seasonal scales, weather influences fuel moisture, the frequency of lightning strikes, and the pattern and rate of wildfire spread. Bottom-up controls include those that are internal to the ecosystem – such as topography, soil texture, vegetation dynamics and insect outbreaks. Topographic position is probably the most important bottom-up control: elevation influences mean temperature - and therefore species composition, as well as rates of evaporation, primary production, and decomposition. Slope influences runoff rates, and aspect has a very large impact on evaporation rates. Vegetation dynamics are also important, as they determine the continuity of fuels – both horizontally and vertically. Insect outbreaks can result in large accumulations of dry, fine fuel that will contribute to increases in fire severity in the event of ignition. Some controls are difficult to classify as either top-down or bottom-up, but have important effects on the fire regime. Examples include grazing by cattle, species introductions, and fire suppression. Grazing by cattle occurs most commonly in forests with an open or partially open canopy. In these areas, grazing results in a decrease in surface fuels, and an increase in the establishment of woody vegetation. The short-term impact is a reduction in fire, but the long-term impact is a conversion of the system from one characterized by low- to mixed-severity firs to one characterized by high-severity fire. Exotic species can also convert regions from low- to high-severity regimes. Examples from BC are unknown, but in California the introduction of Australian eucalyptus has contributed to an increase in wildfire hazard. In the Intermountain West exotic grasses have contributed to increasingly severe, spatially extensive wildfires. Fire suppression can result in a change to the fire regime by influencing stand structure and composition, and the resulting fuels matrix. The effects of suppression on the wildfire regime in BC are a matter of considerable debate, and are discussed in more detail below. Resisters – These species have characteristics that allow them to survive fire intact. For example, they usually have thick bark, rot-resistant wood and long life spans. These species are most commonly found in areas that are subjected to relatively frequent but low-severity fire. Examples in BC include ponderosa pine, western larch (Larix occidentalis), and Douglas-fir (in the interior). Endurers – These species endure fire by resprouting from an intact root system after the above-ground portion of the plant has been killed by fire. This trait is incredibly rare in conifers, but is not uncommon in deciduous vegetation. It is most effective in areas where fire is moderately severe and moderately frequent (relative to the size and longevity of the plant). 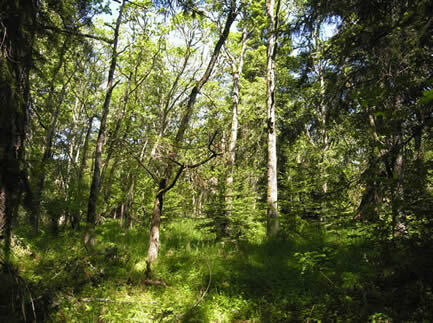 Examples in BC include Garry oak (Quercus garryana) and aspen (Populus tremuloides), as well as many shrub species. Avoiders – These species are adapted to conditions where fire is unlikely to occur. They are typically shade tolerant, since stand-replacing disturbances are rare, and they are often tolerant of cold or wet conditions that inhibit burning. Examples include most of the temperate rainforest species, such as western redcedar (Thuja plicata), Sitka spruce (Picea sitchensis), and western hemlock (Tsuga heterophylla), and many alpine species including yellow-cedar (Chamaecyparis nootkatensis), mountain hemlock (Tsuga mertensiana), and subalpine fir (Abies lasiocarpa). Invaders – These species usually produce abundant seed, have an effective dispersal mechanism (usually wind), and rapid growth rates. They are able to become established quickly in areas that have burned catastrophically. This adaptation is most effective in areas that experience large stand-replacing fires. The best-known example in BC is probably fireweed. Evaders – These species “evade” fire by storing their genetic information in propagules that survive, and are often released by, wildfire that kills the living plant. These species are found in areas that experience moderate- to high-severity wildfires. The best-known example in BC is probably lodgepole pine, which has a serotinous cone that only releases its seed following fire. The invasive plant Scotch broom (Cytisus scoparius) is also a very effective fire evader --complicating the use of fire as a restoration tool in areas where it has invaded. Superimposed on these broad categories of adaptations to fire are a huge diversity of life history traits, dispersal mechanisms, environmental tolerances, and other unique attributes of plants. The specific assemblage of organisms that become established following a wildfire depends on all of these features and the specific fire history of the region. For example, because plants release their seed at different times of the year the seasonality of a fire will influence the specific assemblage of plants most likely to establish immediately post-fire. The spatial extent of a fire determines the distance from a given location to the nearest source of seed – which affects the relative importance of seed dispersal mechanisms. Small fires may be recolonized by species that have heavy seeds, since they do not need to disperse long distances; larger fires will favour the establishment of species with more effective dispersal mechanisms. Some plants, such as Douglas-fir, establish better on bare mineral soil – so they will be favoured following fires that consume all of the organic matter at a site. The fire history of an individual location acts as a sort of filter, exerting one important control on biodiversity through its influence on the assemblage of species that can become established and persist at that site. Fire exerts a second, possibly more important, control on biodiversity, and that is through the spatial mosaic of unique habitat types that are created as a consequence of the variability in fire histories across the landscape. Bottom-up controls on the fire regime result in a patchwork mosaic of fire effects. This patchwork is present at the landscape scale, as different fires burn in different locations at different times, in different forest types, and under different fire weather conditions – resulting in a regional pattern of forest stands that originated at different times in the past, with different specific fire histories. This patchwork is also present at the local scale: As individual fires burn across the landscape their behaviour changes depending on slope, aspect, wind speed, fuel moisture and abundance, and a range of other physiographic and environmental parameters. Consequently, any vegetated landscape in BC is comprised of a network of patches of varying shapes and sizes --each of which has a unique fire history, and consequently supports a distinct assemblage of species. The species present within these patches will be different from neighbouring patches due, in part, to their differing fire histories. One important theory that has been developed to explain the role of fire in regulating biodiversity is the intermediate disturbance hypothesis. This hypothesis, proposed by Joseph Connell in 1978, predicts that the highest diversity will be found in regions that experience intermediate levels of disturbance. With respect to fire, the highest biodiversity should be found in burns of intermediate area, intermediate time-since disturbance, and intermediate frequencies. For example, areas that burn very frequently will contain only those species that tolerate frequent burning; areas that never burn will contain only species that are shade tolerant; however areas that burn with intermediate frequency will contain populations from both groups resulting in the highest biodiversity. Some evidence for this can be seen in the spatial patterns of fire effects that are typical of burns of differing severities. Both low- and high-severity fire regimes are characterized by relatively simple patterns in terms of their effects, and therefore relatively homogeneous habitat structures, fire histories, and consequent species compositions. 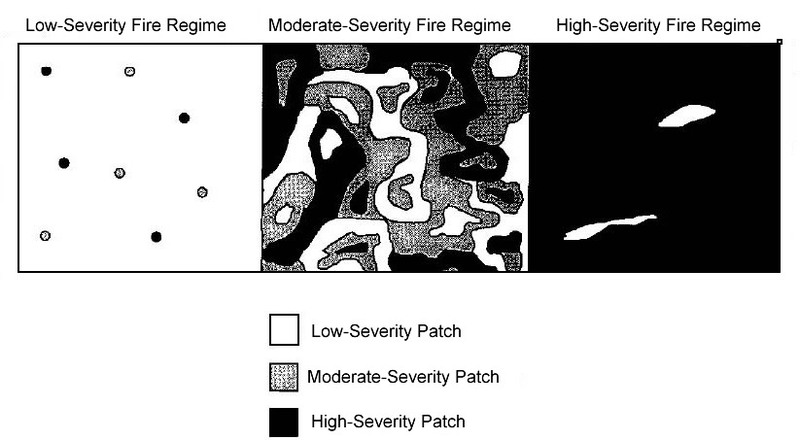 Where fires occur with moderate severity, the resulting spatial structures are not intermediate between low- and high-severity, but are incredibly complex. This complexity in fire history contributes to both alpha and beta biodiversity through the mechanisms discussed above. Agee, J.K. (1998). The landscape ecology of western forest fire regimes. The effects of fire suppression on the fire regime and consequently on biodiversity are more difficult to quantify, and are a matter of considerable disagreement among fire ecologists. In regions of BC that were historically characterized by high-frequency low severity fires – such as in the ponderosa pine - bunchgrass zone in the southern Interior – fire exclusion has almost certainly contributed to a densification of the forest, and an increase in the likelihood of catastrophic, stand-replacing wildfire. Conversely, in the coastal temperate rainforest, and in subalpine forests, fire exclusion has probably had no effect on the fire hazard and little effect on fire frequency. For most of the rest of BC, which is probably characterized by a mixed severity fire regime, the effects of fire exclusion on the fire regime are difficult to quantify, poorly studied, and controversial. Regardless of the natural historical fire regime, one thing is certain: fire suppression efforts are more successful when fire weather is not severe or when fuels accumulations are low. This means that most of the fires that are burning are burning at relatively high severity. While the impact on the fire regime is probably small (more than 95 percent of all area burned occurs during about 1 percent of the fires), the effects on biodiversity may be considerable. Because small fires are being suppressed the landscape as a whole is being homogenized: small patches that would historically have burned at low severity, giving rise to specialized habitat types, are now burning only during large wildfires under the most severe fire weather conditions. This homogenization has undoubtedly contributed to the current mountain pine beetle epidemic. 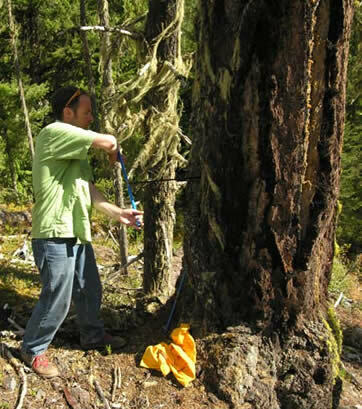 It also has probably resulted in the loss of structural diversity in the form of standing dead wood in close proximity to living trees, and the loss of mixed age forests in many parts of BC. One region of the province where fire exclusion is undoubtedly having an impact on biodiversity is in Garry oak associated ecosystems. These ecosystems comprise a complex of coastal bluffs, grasslands, meadows, savannas and woodlands that are scattered throughout southern Vancouver Island and the Gulf Islands. They support over 100 threatened or endangered species, including more than 85 percent of the species at risk in BC. Most of the historical range of Garry oak associated ecosystems were present in BC as a legacy of intentional burning by First Nations. Fire was used to maintain an open canopy, and promote the growth of food crops such as camas and bracken fern, and to provide forage for game species. The arrival of European settlers in the region around 1850 brought a stop to this practice. Since then, over 95 percent of their original distribution has been lost to urban development and agriculture. The remaining 5 percent is being degraded due to species introductions and conifer encroachment associated with fire exclusion. Unfortunately, simple re-introduction of fire to these systems is unlikely to reverse the trend of degradation for several reasons: First, 150 years of fire exclusion has resulted in high fuel loadings, including “ladder” fuels that allow surface fires to get into the forest canopy, burn at high temperatures, and kill large numbers of trees. Second, the introduction of a wide range of exotic plants means that fire has the potential to disproportionately benefit these species. Particularly problematic invasive species include orchardgrass (Dactylis glomerata), velvet-grass (Holcus lanatus), sweet vernalgrass (Anthoxanthum odoratum), gorse (Ulex europaeus), and scotch broom. Broom, in particular, produces extremely high numbers of seeds that persist in the seedbank for decades and that germinate rapidly following fire. Consequently, fire used as a restoration tool can result in complete dominance of an ecosystem by broom – rather than its eradication. Climate has always fluctuated, and biodiversity has continued to increase at a global scale in spite of these changes (and in spite of mass extinctions). However rapid climate change of the sort expected over the next century is likely unprecedented in the recent evolutionary history of the vegetation of BC. While our understanding of the interactions between climate, vegetation and disturbance remains limited, as does our capacity to predict the climate of the future or the frequency of severe fire weather. Nonetheless, there are some statements that can probably be made with confidence regarding the future of fire in BC’s forests: First, it is very likely that as BC’s climate warms larger, more severe wildfires will occur than have historically. This change is due to the large-scale homogenization of the landscape that is occurring as a consequence of logging and fire suppression, coupled with the increasingly warm dry summers that most climate models predict. Similarly, in a warmer and drier climate the fire regime will shift towards higher relative frequency. For examples, in areas where the fire return interval is currently ca. 75 years, it may shorten to 50 years over the next century. The implications for biodiversity are potentially significant: not all species tolerate fire well, and in the rapidly changing climate vegetation will be increasingly out of equilibrium with its environment. As species shift their distributions in response to the changing climate fire is likely to be a dominant process. Fire is an essential component of BCs forests. It plays a critical role in determining the species that are able to establish and persist throughout the province, and likely also contributes directly and indirectly to the high numbers of species that are able to coexist at both local and regional scales. Fire exclusion through grazing by cattle, regulation of First Nations, and direct suppression efforts has probably had differential effects throughout the province, but has probably been most effective in regions that experienced frequent fire – such as in Garry oak associated ecosystems in coastal regions and in the ponderosa pine - bunchgrass communities in the Southern Interior. Simple reintroduction of fire as a management tool is complicated by the introduction of many exotic species, changes to the fuels structure that have occurred over the last 150 years, and the rapidly changing climate. However given fire’s importance to creating and maintaining biodiversity it is essential that land managers and scientists resolve these issues with all possible haste–fire will return to BCs forests, whether we want it or not. 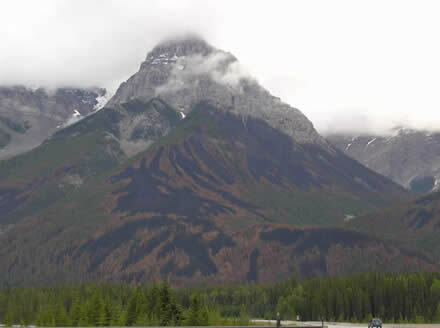 A complex pattern of high, moderate, and low severity impacts are visible in this 2005 prescribed burn in Yoho National Park. The fire increased regional biodiversity by creating a mosaic of forest patches of different ages and burn severities. It also reduced the likelihood of a catastrophic wildfire spreading across the region by interrupting the continuity of fine fuels across the landscape. Plants exhibit an amazing diversity of adaptations to fire, ranging from the thick bark of trees like Ponderosa pine and Douglas-fir (above left), which allows them to survive low intensity fires, to the serotinous cones of lodgepole pine (above right), which encase seeds in a protective “shell” until a high-intensity fire melts the resin that seals the cones and releases the seeds. The diversity of adaptations to fire coupled with the diversity of fire regimes contributes to the overall diversity of British Columbia’s ecosystems. 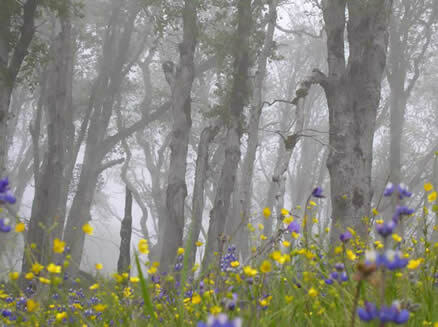 Because fire suppression efforts are able to contain all but the most severe wildfires, plants that are adapted to other fire regimes are becoming less common. Garry oak associated ecosystems, such as this meadow and woodland in Helliwell Provincial Park, on Hornby Island, likely exist in British Columbia specifically because of frequent fires that were set by First Nations to promote the growth of food crops and forage for game species. In the absence of fire Garry oak ecosystems are often encroached and overtopped by the adjacent conifer forest – resulting in the extirpation of a wide range of shade intolerant vegetation, and the organisms that depend on them for habitat, food, or other resources. Shown here is a Garry oak stand at Rocky Point being overtopped by grand fir and Douglas-fir. Unfortunately, fire is not a restoration option here, as the site is adjacent to the ammunition depot for the Canadian Armed Forces. 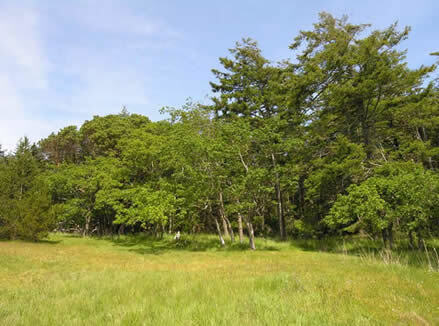 In Garry oak associated ecosystems where frequent burning has been maintained, such as this one in Redwoods National Forest, California, biodiversity is high and the abundance of exotic invasive species is typically low. 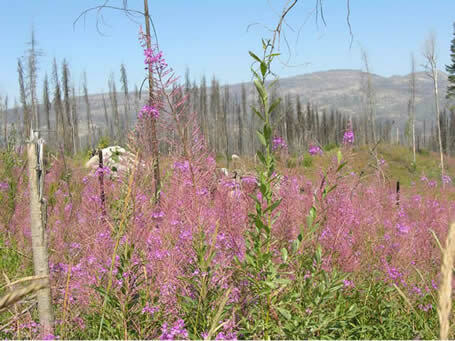 Fireweed is a post-fire invader (fire-following species), rapidly becoming established following wildfire (or logging), and persisting for only a few years until it is overtopped by woody vegetation. It survives at a landscape scale as a transient, moving from one disturbed area to another.